Shai Mitra is a birder-extraordinaire, a wonderfully patient teacher, a member of the New York State Avian Records Committee, and editor of The Kingbird, the peer-reviewed publication of the New York State Ornithological Association. He was also nice enough to give directions to good birds in Suffolk County when a pair of bird bloggers headed out there a couple weekends ago and kind enough to discuss, in detail, every aspect of a bird’s plumage when one is looking at it and wondering what field marks one is missing. Not only that, but he will even take the time out to write a blog post about finding and identifying Arctic Terns on Long Island even though he would, we can be sure, much rather have been birding. His edifying and entertaining blog post is below (all text and photos copyright Shai Mitra). When Corey asked me to discuss finding and identifying Arctic Terns (Sterna paradisaea) on Long Island, it occurred to me that the exercise could provide insights into one of the most general and familiar of birding challenges—how can I discover something new through my own birding? That many birders enjoy the excitement of discovery is proven by the popularity of listing species, perhaps the simplest, least nuanced measure of birding achievement. But for New York listers, Arctic Tern is an odd duck indeed—a rare bird of a special kind. It’s probably not an exaggeration to propose that more birders have checked off Western Reef-Heron, Roseate Spoonbill, Spotted Redshank, Broad-billed Sandpiper, Long-billed Murrelet, and Scott’s Oriole on their New York State lists than have confidently identified an Arctic Tern in the Empire State. Perhaps Corey Finger and Andrew Baksh haven’t been birding New York long enough to have seen all six of these motley megas, but on 21 June 2009 they savored the pleasure of genuine discovery: seeing in flesh and feather a living, breathing Arctic Tern; recognizing its individual as well as its species identity; and appreciating the stark divide separating the actual bird from the lifeless abstractions of field guides, photos, etc. Objectively, the most unusual birds of our trip on 21 June were Arctic Tern and Western Sandpiper. A moment’s reflection, however, reminds us that these are two of the most abundant birds in North America and that their novelty for us was simply a relative function of time, place, and experience. Although I sometimes dream of seeking the Chinese Crested Tern or the Spoon-billed Sandpiper in their remote last haunts, I’ve become quite comfortable accepting that rarity is much more often a relative thing—something specific to my own unique combination of knowledge, interest, and habit. Viewed this way, it was very pleasurable for me to share Corey’s and Andrew’s enjoyment of not just the “rare” species we saw together, but also of the familiar birds they may have discovered anew—Common Tern and Semipalmated Sandpiper, for example. On Long Island, finding and identifying Arctic Terns is aided by four skills, which of course can be generalized or modified for application to other species as well: understanding how terns behave in our area; recognizing the various plumages of Common Tern; understanding how these Common Tern plumages relate to age and breeding status; and knowing how the corresponding plumages of Arctic Tern resemble and differ from those of Common Tern. For many birders, the most neglected forms of discovery are the first three of these, the ones relating to the common species that we know less well than we think we do. 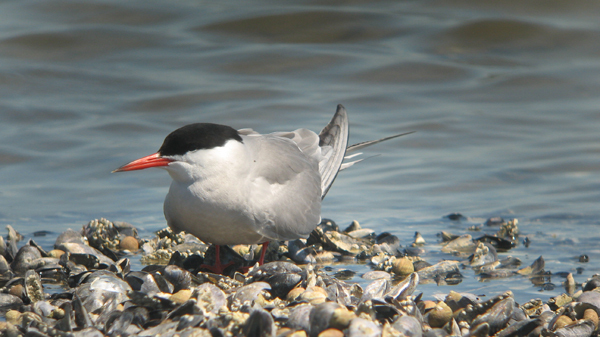 The vast majority of Common Terns on Long Island during June are breeding adults, whose neat black caps, muted gray underparts, robust orange-red bills with black tips, fierce countenance, medium-long orange-red legs, and medium-long tail streamers render them among the most beautiful creatures I know. These birds are so common here that they may give the impression of ubiquity, but viewed quantitatively, the adults show an exaggerated clustering around several major and a larger, but still limited, number of minor breeding colonies. The precise locations of the colonies shift over decades, influenced by a complex interaction of factors, but they are absolutely constrained by the need for safety from disturbance to the vulnerable eggs and young. What this means is that colonies are not always found in the best places for a tern to be, but rather in secure places as close as possible to places where terns would otherwise like to be. 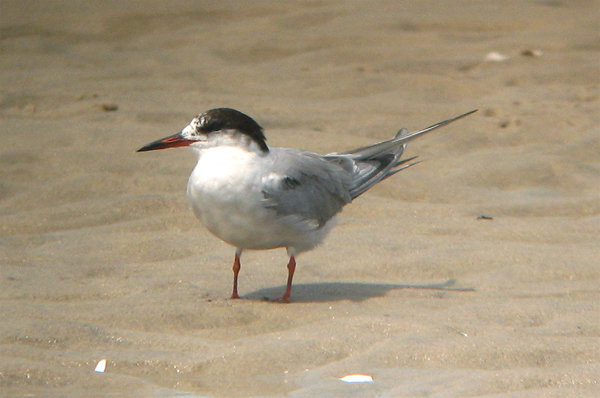 If one were to carefully examine every breeding Common Tern on Long Island, searching for a bird whose black cap extended farther down toward its gape and cheeks but less far down its nape, whose underparts were more extensively and intensely gray, whose bill was slighter and blood red to the tip, whose expression was gentler, whose blood-red legs were shorter, and whose tail streamers were longer, I would guess that you’d probably have the pleasure of studying 10,000 or more gorgeous adult Common Terns before you chanced upon an adult Arctic Tern dropping in for a visit. As much as I can’t get enough of gazing upon Common Terns, this is not how I find Arctic Terns. 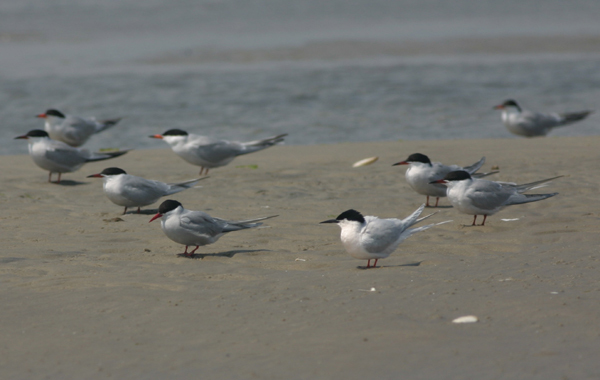 A small minority of Common Terns on Long Island during June resemble breeding adults, but exhibit one or more differences from definitive breeding condition: the lesser coverts are dusky, the forehead is white or flecked with white, the underparts are less extensively gray, the tail streamers are shorter, or the bill or legs show dusky markings. These birds are called “second-summer types” and include two year-old birds as well as some older birds that for whatever reason fail to attain full breeding condition. Recognizing this plumage is important for birders because birds of this appearance, unconstrained by the responsibilities of breeding, are free to loaf around the very most favorable places for terns. On Long Island, these are sandbars near the ocean inlets: Rockaway, East Rockaway, Jones, Fire Island, Moriches, Shinnecock, Mecox, and Sagaponack. Access to these places during summer is not a trivial matter logistically, but with diligence, a careful observer should be able to find a place where second-summer type Common Terns gather during June. Careful attention to a well-chosen loafing flock is likely to yield a few terns whose shape and structure are unmistakably those of Common Tern, but whose coloring is radically different from those described above: the carpal bar is darker and more extensive, the forehead is entirely white, the underparts are mostly or wholly white, the bill and legs are blackish, and the tail streamers are even shorter than those of second-summer types. These are first-summer Common Terns, and they are unusual birds themselves in North America, as most stay south during their first summer. Their presence in a loafing flock is an excellent indicator that you have found a dynamite place for non-breeding terns. The upshot here for the avid lister is that, in contrast to poor odds of about 10,000:1 for adults, among good flocks of loafing non-breeders you might need to scrutinize only twenty second-summer type Common Terns, or ten first-summer Common Terns, before you found an equivalently plumaged Arctic Tern. At this point, some fairly technical matters of timing and extent of molt need to be considered, but because this piece is already too long, I’m going to demur from providing exhaustive detail for the fourth and final step in the process—describing how these immature plumages of Arctic Tern resemble and differ from those of Common Tern. If you have tackled the first three steps with due diligence, the fourth will be the easiest. Upon completing the whole process of finding and identifying an Arctic Tern on Long Island, you may even find that finally listing the species constitutes a lesser joy than the many discoveries you made along the way. This is certainly true for me. After thirty Arctic Terns at three of Long Island’s ocean inlets over thirteen years, I’ve discovered that this species is much less rare than people thought, even very recently. But this is not to imply that this species bores me now. Far from it, I find great enjoyment in recalling each bird and what it meant to me at that particular time in my studies. As suggested above, this approach can be modified for any species. To find a Western Sandpiper, learn Semipalmated Sandpipers really intimately, rather than glossing over them as a ubiquitous default backdrop. One might say that Andy Baldelli’s awe-inspiring hip-shot on the Western Sandpiper on 21 June was merely a late-stage symptom of his pathological compulsion to stare at Semipalmated Sandpipers! Although trite, there is absolutely no doubt that discovering new things through one’s own birding starts with taking a skeptical look at the checklist as a measure of birding achievement. I’ve known birders with ABA lists pushing 700 who honestly could not identify an immature Ring-billed Gull with confidence on their own. Needless, to say, this state of affairs is not likely to enhance one’s enjoyment in finally seeing a Mew Gull—and isn’t enjoyment a better measure of our time spent birding than arbitrary and abstract numbers? It is an inescapable irony that the more successfully one pursues what’s rare, the less rare it becomes. For me, pursuing Arctic Terns has yielded many pleasures far greater than those of preparing NYSARC reports, posting to the listserv, or writing guest blog posts—not the least of which has been an intensifying infatuation with an ineffable beauty of the inlet sandbars…. I’ll conclude by inserting this as step one in my guide to finding and identifying Arctic Terns on Long Island: don’t fight it, admit that you too are in love with Common Terns! Excellent, thought provoking & well written post. The fact that this guy loves what he does shines through in every sentence. You guys just keep setting the bar on bird blogging higher & higher. Shia Mitra you are a fantastic writer. Please write more often. The only thing I would change: Don’t shy away from “fairly technical matters of timing and extent of molt.” The ol’ internet needs more exactly those things, and your readers can not only handle it but are thirsting for it. It was also nice to finally put a face to the name as our paths briefly crossed looking for the Mississippi Kite in Montgomery County, NY. You folks took off just before the rain. An extremely informative post by Shai, his passion is just clear through it all. And great truths uttered by the voice of experience – something some birders ignore in the race for the most ticks in the shortest space of time. Once we cannot enjoy watching a “common” species anymore and want to rush on for the next lifer – are we still birdwatching or have we become simply just Twitchers?! 1. Andy Baldelli, Pat Lindsay, and I ran into Corey and Will half-way across the state during a shameless chase of a new bird for our NYS lists (well over 400 for Andy and Pat). 2. 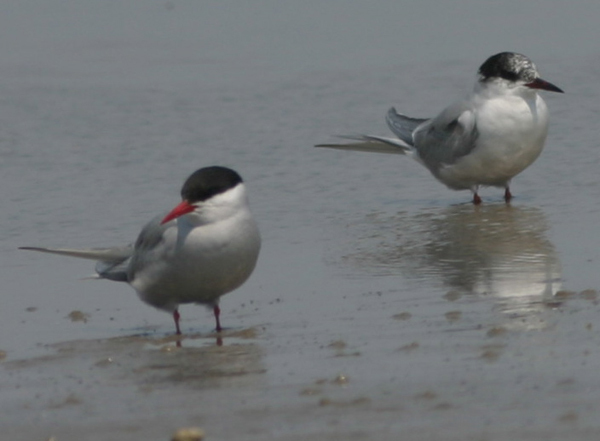 A couple of our friends on Long Island went out and used the principles described in this post to find three Arctic Terns! Hello all from across the Pacific in eastern Australia. Thank you Shai for your blogpost it has stood me in good stead over here. Our regular commic terns here are interchangeable with wintering White-fronteds from New Zealand departing later in the austral spring and then replaced by Common Terns from the northern hemisphere. While getting acquainted with White-fronteds this July I noticed a smaller bird, which I took to be a wintering Common Tern and it turned out to be so, but someone had said it looked like an Arctic. At that point I didn’t now enough about our Common Tern plumages or Arctic Terns to be confident one way or the other, so I set about rectifying that circumstance. At the time I went looking for help on the internet and I happened upon the above blog, since you guys obviously have the two species (albeit a different Common Tern ssp. ours is longipennis not hirundo) sitting together on a sand spit more often than we do. The Common Tern stayed for two days and departed for who knows where, but I found myself anxiously awaiting the arrival of the Common Terns, so I would have an excellent opportunity to compare the White-fronteds and Common Terns side by side. In late October I got to do just that, but almost instantly noticed a smaller bird again. Knowing what i had learned about Arctic Terns back in the July experience I set about checking for Arctic Tern characters, taking plenty of pictures and low and behold, an immature, likely second year, Arctic Tern had turned up on our local rock shelf. An observation only made possible, because I got more than a little excited about our regular birds. Who knows how many unusual faces hide amongst the mob that we never notice, because we ignore the usual. At the time we had the pleasure of 5 tern species on the rock shelf at once and a total of 9 tern species in our wider locality – if local estuarine habitats were included. Thanks again for the pep talk about practical birding …..